We are now well into 2017 and we see some exciting prospects for how the dynamic glass industry will continue to grow and evolve. According to a new market research report “Smart Windows Markets 2016 – 2025” from n-tech research, they predict the market for active glass will reach almost $8 billion by 2025. While no one really knows how these “crystal ball” forecasts of the future will turn out yet, it is indicative of the momentum and investment the dynamic glass market is generating. Here are a few of the dynamic glass industry trends we expect to see accelerate in 2017. According to “Smart Windows and Smart Glass 2014-2024: Technologies, Markets, Forecasts,” the building sector is potentially the highest volume market for dynamic glass. Commercial office spaces are leading adopters of this technology because building owners can achieve significant cost savings while enhancing the occupant experience and workplace productivity. 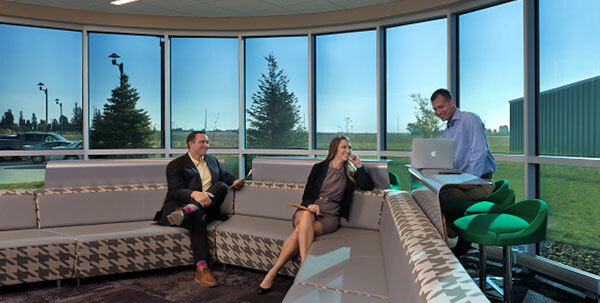 Along with having an impact on energy efficiency and cost savings, dynamic glass provides employees with access to outdoor views and natural daylighting, which has been proven to improve employee health and productivity. Due to these benefits, we have already seen our dynamic glass installed in a number of commercial office spaces in the past year including the Saint-Gobain & CertainTeed North American Headquarters in Malvern, Pa.; 1738 Pearl Street in Boulder, Co.; Advent’s commercial office in Omaha, Neb. ; and Sukup Manufacturing’s Headquarters in Sheffield, Iowa. We look forward to seeing a greater number of installations in commercial office spaces as dynamic glass gains traction among building owners and architects who begin to advocate for our product. Due to our recent successful global installations, including our installation at the Bellavista Eye Clinic in Switzerland as well as the Swiss International Scientific School in Dubai, we expect to see increased activity across Europe, the Middle East and China as word of the benefits of dynamic glass continues to spread. In addition, Asia Pacific and Europe have large scopes for dynamic glass installations, and we plan to continue to build out our installations in these areas. We are already beginning to see increased activity in these areas and were selected as the glazing provider for the huge skylights on the new Beijing headquarters of Tencent Holdings, one of the largest Internet service companies in the world, which is truly a testament to the quality of our product as well as the growing need for dynamic glass installations in the global marketplace. There has been a growing emphasis on sustainable building and design, and with the addition of a plethora of new green building and rating systems, this field shows no sign of slowing down. According to Dodge Data, global green building continues to double every three years. As architects, building owners and consumers continue to focus more on how to design for the environment as well as building occupants, we believe dynamic glass will become a product that is consistently brought up in the initial conversations surrounding how to create and design a sustainable building. Our dynamic glass’ contribution to overall energy savings indeed speaks for itself by reducing buildings’ reliance on overhead electrical and HVAC systems. SageGlass dynamic glass is capable of reducing overall energy loads, heating, cooling and lighting by up to 20 percent and peak energy demands by up to 26 percent. With these trends expected to come down the pipeline, we are looking forward to what 2017 has to offer and how the dynamic glass industry will continue to grow and expand.